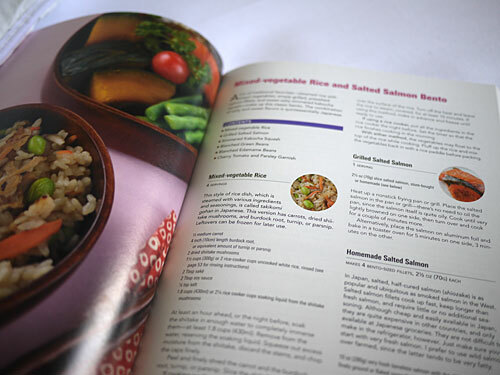 In this section, you’ll find all the news, updates and so on about the Just Bento Cookbook, published by Kodansha USA. It’s available now worldwide. Wholesale Inquiries: Please contact the publisher, Kodansha USA Inc. . Please ask at your local bookstore if they have the book in stock! Find your local independent book seller . It’s also available online or in-store where applicable from Barnes and Noble, Border’s, and Powell’s. Bento&co  may still have a few copies available for shipping worldwide - good to know if you’re ordering bento boxes from them anyway! CasaBento  has it in stock too! It’s available now at Kinokuniya  bookstores worldwide! In London, it’s available at Japan Centre . I’m also proud and honored by all the reader reviews it has received so far on various sites, most notably on Amazon.com . 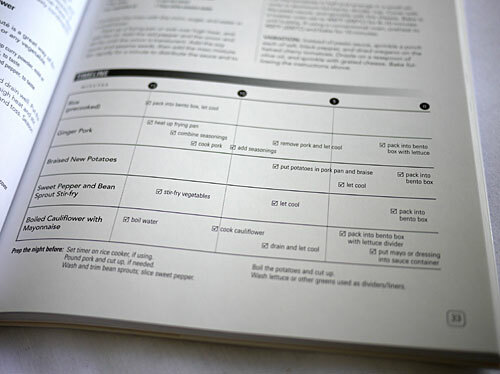 It was also selected by the Amazon Editors as one of the top 10 Cooking, Food and Wine books of the first half of 2011 . Update: The book is out written, and published, and selling well too! Read about it here . I announced over on Just Hungry  that I am working on a bento cookbook tentatively titled The Just Bento Cookbook, which will be published in 2010 by Kodansha International . Here are some more details about it. Please note that it’s still early days in the life of the book, so things are subject to change. Yes, it will be all in English, and 100% originally written by me, not a translation of a Japanese book. I have avoided duplicating the recipes that are on this site or on Just Hungry as much as possible, though there are a few basic ‘foundation’ type recipes. I’m also cramming in as much how-tos and tips as space will allow. 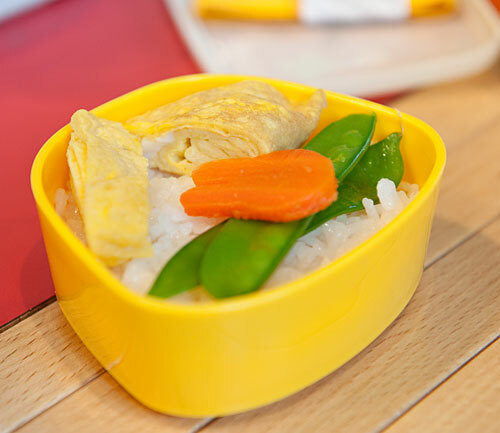 It will have both Japanese and not-Japanese, bento-friendly recipes. For the Japanese recipes particularly, I am very conscious of sticking as much as possible to ingredients that are relatively easy to get outside of Japan. (Remember this survey ? This is what that was all about.) The whole premise behind Just Bento is that it’s possible to recreate Japanese flavors with limited access to ingredients that are taken for granted in Japan, and the same principles will apply to the book. Most of the bentos can be assembled in under 20 to 30 minutes, with some reliance on premade staples - just like the bentos here! There will be a focus on healthy, balanced, attractive yet unfussy bentos - just like here! It will have recipes for omnivores and vegetarians alike. ETA: The book will be printed in Japan, by the International division  of the largest publishing company in Japan, Kodansha Limited (Wikipedia entry ; Japanese site ). Kodansha International has worldwide distribution . I can’t guarantee your local bookstore will carry it of course! But it will most likely be sold on various online bookstores. Anyway, as I said over on Just Hungry, I am facing a big deadline for the book in a few weeks. So new posts here are going to be a bit sparse for a while, since I want to make the book as good as it can be. In the meantime, please register and participate in the forum  if you haven’t already. I’ll also be featuring some good things from the archives. I’m putting out a tentative call for guest posts. If you would like to have a guest post featured here on Just Bento during my semi-absence, please read the guest posting guidelines  first. Due to time constraints I will only be able to accept posts that are ‘ready-to-publish’, so please take note of the formatting, format, subject matter, etc. requirements. Thanks! Update: The call for guest posts is closed for the time being. Look out for another call in a few months! Yesterday I finally received a copy of The Just Bento Cookbook, fresh off the presses. I’ve seen the proofs or galleys, but the Real Thing exceeded my expectations. It really looks fantastic - not just the great photographs by the other Makiko-san, but the layout, the print quality, - everything. The Japan version has a paper belt or “obi” around it, which has some blurbs and information in Japanese. I believe that the version sold in the U.S. and elsewhere won’t have this obi (though it’s possible that copies carried at Japanese bookstores may). Here are some peeks inside the book. Each of the main recipes have a little picture of the corresponding item in the featured bento, so you know exactly what is what. I tried to vary the bentos for the seasons. Here’s a Summer Vegetable Casserole bento, from the not-so-Japanese bento section…. …and here’s another one from the same section, a Soup and Muffin bento with poached apples, packed into a thermal lunch jar for the colder months. A couple more shots! A mini-hamburger bento with cut-outs. I kept the decoration ideas very simple. A “chakin zushi” (egg-wrapped sushi) bento with stewed lotus root and hijiki seaweed. I believe this is the most Japanese bento I have in the book, in terms of ingredients. Lotus root (renkon) is about as exotic as I got with the vegetables, but you can easily substitute another vegetable dish for it if you wanted to. And dried seaweed can be easily mail-ordered if it’s not at your local Japanese or Asian grocery. There are 25 total bentos; 15 Japanese, and 10 Not-so-Japanese. That may not seem like a lot…until you consider that each bento has tons of variation recipes. So you can mix and match to come up with dozens of combinations that work! I’m quite proud of the Not-so-Japanese bentos. I tried to come up combinations that have a ‘bento aesthetic’ - colorful, varied and appetizing meals packed into a compact box, that taste good hours after they are made. I hope I’ve succeeded! I am really my own worst critic, but looking through the book several months after completing it, I have to say that I am really very happy with the results. As I wrote previously , this is a practical, everyday bento lunch book, for people who want to bring, or make for their loved ones, tasty, healthy and varied lunches to work or school, on a regular basis. As I keep saying - I hope I’ve succeeded! Check this list  for when and from where the book will be available. First and foremost, I could not have even contemplated writing this book without the tremendous support and encouragement of the JustBento.com readers. Thank you! You would think that I would have spotted this earlier, but no….the book has gone to 4 printings already and I just spotted it last night ><. Fortunately it’s not a really critical error, unlike the one in the Muffin recipe (which was corrected in time for the 2nd printing, hooray!) but if you are watching your calories, it is something worth watching out for. So, here it is. On page 79, the recipe for “Deconstructed Salade Niçoise” has the wrong amount of olive oil. It should be 1 Tbsp (tablespoon) rather than 2. Using 2 will not ruin your dish - it will be a bit more oily, for sure - but calorie wise that’s an additional 120 cal or so, that you may not want, even if it’s heart-healthy olive oil. Apologies for the error! It will be corrected in subsequent printings. 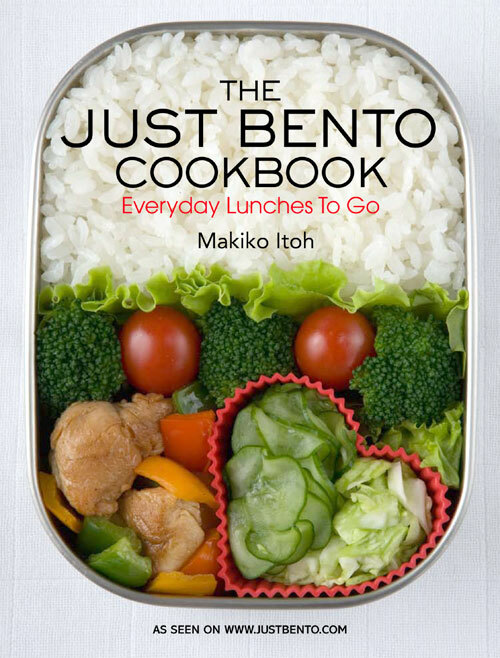 I’ve been getting several emails asking about the availability of The Just Bento Cookbook. Apparently it has been selling out and is out of stock, even on Amazon.com . I am happy to say that the book is being reprinted again as we speak, so hopefully you should be able to pick up a copy before the holidays. It will be the 5th printing for the little book, which is just amazing to me. There was a delay between this and the previous printing, mainly because the book’s publishing rights were technically transferred to another company. At the end of March (the end of the fiscal year in Japan), the original publisher, Kodansha International, suddenly decided to close its doors. Most of the publishing rights to their catalog were transferred to a brand new company called Kodansha USA. I know it may seem like the same company, but they’re not. Kodansha International was based in Tokyo, while Kodansha USA is a U.S. company based in New York, with entirely different staff. (I think a few former Kodansha International people may have transferred to USA, but I’m not certain. My editor did not.) For a while I was not even sure my book would be reprinted again, but I’m happy to say that it will be. The new printing will be a bit different from the previous ones - it will be printed in Canada, not Japan, and will not have a dust jacket I understand. But the contents will remain the same. Several people have also asked me about a Kindle or other digital version of the book. The decision to issue a book in ebook format or not is up to the publisher, and so far they have not decided to go that route. So there’s no ebook version for the forseeable future. So, that’s the news on the book! If you are waiting to get a copy, thank you for your patience! Back from the book tour! I have been back from my US mini-book tour for a week now. I’m still rather jetlagged, but I’m really happy to have met so many wonderful people! I only got to visit New York and Seattle, and wish I could have done more, but considering that this was my First Book Tour Ever, and that before I embarked on it I was frankly scared to death, I think it went really well. We gave away two filled bento boxes at the event. This one is one layer of a Pikachu bento box, with bunny shaped carrot and tamagoyaki. The boxes were from Kinokuniya’s gift department (which has a much expanded bento box selection from when I checked it out a year ago). 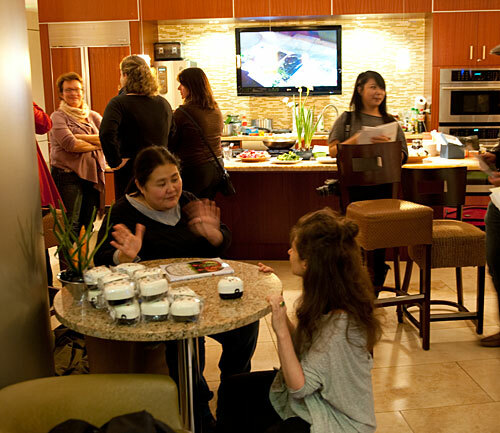 This is from a party-event for bloggers hosted by the lovely Viv of Seattle Bon Vivant . Viv knows absolutely everyone in Seattle, and she’s hosted book events in the past for such food world luminaries as Dorie Greenspan and Amanda Hesser. I was not worthy! We had such fun in any case. I made chicken karaage (with lots of help from The Guy), broccoli with wasabi sauce, apple bunnies (note to self: Red Delicious apples are nice and red but do not taste good), and onigiri. I think the onigiri were the most popular. I met so many other bloggers too, such as Shirley of Lovely Lanvin , Tara of Tea and Cookies , Lisa of Gluten Free Foodies , Matthew of the Spilled Milk Podcast , and Luuvu of Luuvu ! Lisa (if you have a blog let me know!) brought me some of Seattle’s famous Fran’s Salt Chocolate Caramels - thank you so much Lisa! Then the final event was hosted by Kinokuniya again, this time the Seattle store, which is attached to Uwajimaya, the family run Japanese grocery chain. I was esconced behind the takeout-bento counter of Uwajimaya, right in front of the Kinokuniya store entrance. It was super-busy due to the Chinese New Year. People kept asking me for store directions! Neverthless it was another successful event, with lots of people stopping buy, some just to say hi, and many others to buy and get their books signed! I met more bloggers here too, especially Ms. Sonoma Bento , who was up in Seattle to visit family. Daniel stopped by and gave me a beautiful sock knitting kit! Thanks Daniel!! Tara and Viv stopped by to see me again, both bearing gifts of…food! Such wonderful ladies both. This is me at the end of a hectic two hours. I’ve obviously lost the plot. Thank you, thank you to everyone who came to see me, who bought books, who helped clean up after some events, and so on… it was such a pleasure. 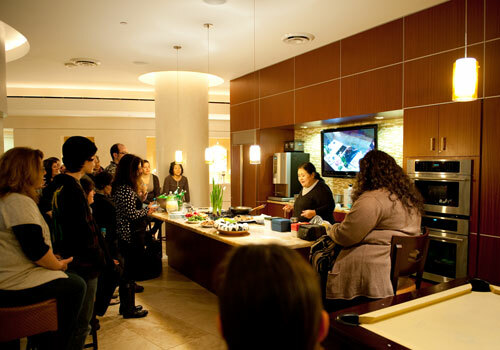 Special thanks go to Viv of course (anyone who wants to have an event in Seattle should contact her first! ), and to Sumi-san and the ever patient sales and marketing director at Kodansha America, Laura-san. Hontou ni osewa ni narimashita! I am having a blast here in Seattle, promoting the Just Bento Cookbook. We had a terrific private blogger-event/party hosted by the lovely Viv of Seattle Bon Vivant  on Wednesday, where I got to meet a lot of food bloggers, and yesterday I had a book talk and signing at the wonderful Third Place Books  in Lake Forest Park. (I tell you, if I had a bookstore like Third Place Books in my neighborhood, my bank account would be in serious trouble.) I've already met lots of beautiful Seattle people through these events, as well as the equally beautiful New Yorkers who came to Kinokuniya's US flagship store on Bryant Park last Saturday. I have to confess, before I embarked on this little book tour I was really nervous...but I find that I am really loving meeting and talking to so many bento fans! I'll be editing and posting some photos very soon. Tomorrow, Saturday January 29th, I will be at one final event in the Seattle area, at local institution Uwajimaya in downtown Seattle , co-sponsored by Kinokuniya Bookstore, which is located right in the Uwajimaya (or Uwaji as the locals call it) complex. 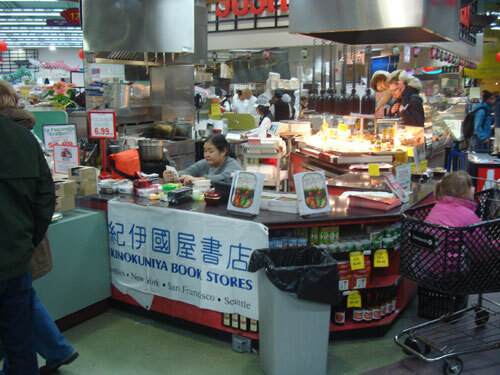 (For non-Seattle-ites, Uwajimaya is a family-run Japanese, Korean and general Asian grocery store and more - fantastic resource for fans of east Asian food in general and Japanese food in particular. Uwajimiya also sells Japanese food products online via Amazon.com Groceries.) This time around I won't be doing a talk, but I'm going to be available for questions and to sign your copy of the book and so on from 1pm to 3pm. 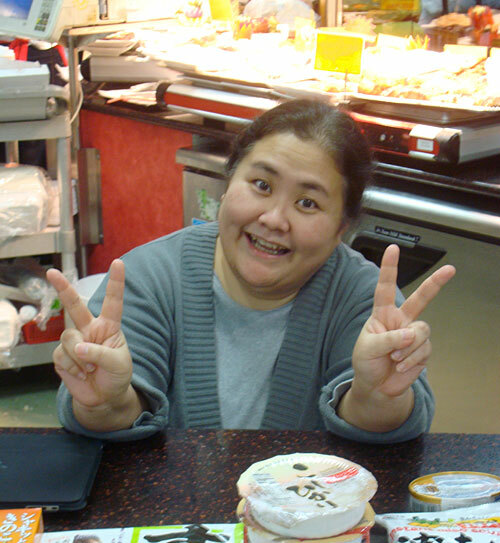 I'll be at the sushi/deli counter right near the Uwajimaya side entrance to Kinokuniya. I hope to see you there tomorrow! I’m sorry about the lack of updates around here! I am currently on the road, in the U.S., dealing with family stuff. But there’s another reason I’m here! As you already know if you follow @justbento on Twitter  (or my ‘personal’, more esoteric Twitter account, @makiwi , I am going to do a few book promo events. Here is the schedule as of now. 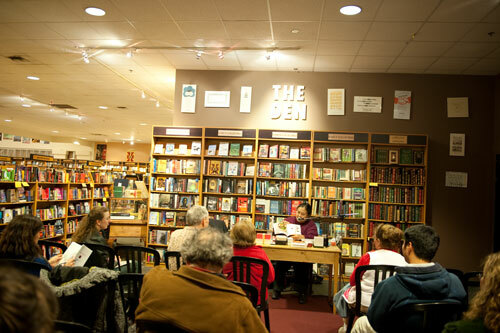 Seattle-area event 2: Talk and Book Signing at Third Place Books, Lake Forest Park. Saturday, January 29 1:00 – 3:00 PM. I know, why 1 NY event and 3 Seattle events? To paraphrase Jessica Rabbit, I don’t know, I’m just scheduled that way. ^_^; As of now, no further events are planned, but if they do get scheduled you’ll hear about them here of course. So, sales of the book are surpassing everyone’s expectations. It sold out before the official US publication date on Amazon.com, was back in stock briefly, then promptly sold out again. Not only is the 2nd printing gone, the 3rd printing has come off the presses this week and is being shipped to stores as we speak! (Update: Today (January 20th) I got word that a 4th printing has been scheduled now! And it’s not even the end of January!) I checked around a bit and it does look like Barnes & Noble has it in stock still . If you’re an Amazon shopper, your best bet is probably to just put your order in  ^_^; Don’t hold me to this, but the 1 to 3 month delivery time listed is probably them being conservative. Barnes & Noble seems to have it in stock . Check at your local bookstore  or Japanese grocery store too. For non-US places to get the book, please refer to the list of sources . A big thank you to everyone who has gotten it or is planning to get The Book…and, despite not being in stock even, making it (as of this writing) no. 1 in the Japanese cookbook category ! I am floored, and honored. I haven’t talked a lot about my book since I started working on it last September, but here’s lots of news about it. The final edits were finished up last week, and the files went to the printers…yesterday! I’ve only seen the PDFs, but it really looks fantastic. And, it’s already available for pre-order on all the Amazons! The purchase links are near the end of this post. It is softcover with a dust jacket, just like a Japanese bento cookbook. 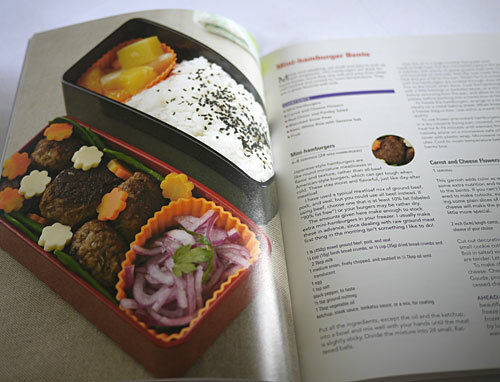 If you like the look and feel of Japanese cookbooks, you’ll love the look and feel of The Just Bento Cookbook for sure! We decided early on (as I mentioned in my post back in September ) to keep it softcover, so that it would be affordable and easy to use. 85-90% of the recipes are brand new, never featured on Just Bento, Just Hungry or anywhere else. The rest are some basic “foundation” recipes and how-tos, plus a few favorites. (You can’t have a bento book without things like how to cook rice, tamagoyaki, and onigiri, you know!) Some old favorites have been revised and refined too. 60% of the recipes are for Japanese-style bentos; the rest are for what we decided to call Not So Japanese bentos. You could call them lunchboxes, but I just like to think of them as “international” food put together with a bento aesthetic and philosophy. Tons of tips! The book is crammed with tips. Maybe too many tips, I don’t know! (Edited to add) The measurements are in both U.S. and metric. In other words, I’ve used cups (using the U.S. cup measurement of approximately 240ml) and ounces as well as grams and milliliters. So wherever you are, you should be able to measure things properly! By having a mix of Japanese and Not So Japanese recipes and bento boxes, I hope that the book will appeal both to Japanese food fans as well as people who aren’t that fond of Japanese food per se, but are interested in putting together tasty and attractive bento boxes or lunch boxes or however you want to refer to them. Besides condiments and flavorings, the only Japanese ingredients I used were the basic seaweeds (wakame, konbu, and nori), frozen edamame, umeboshi, tofu and abura-age (fried tofu skins) - and of course, Japanese style rice. I think you can find most of these at many supermarkets these days too, except perhaps for umeboshi…but only a couple of recipes call for umeboshi so you can avoid those easily. In particular, I avoided using the convenient ready-made foods that are standbys in Japanese bentos, but are not widely available outside of Japan - things such as all the fish-paste products (kamaboko, chikuwa, fish-paste sausage), not to mention Japanese-style cuts of meat (very thinly cut or finely chopped (not minced) pork and beef). In any case, the Japanese bento recipes do taste “authentically Japanese” but should not be hard to put together for most people around the world. I’m particuarly proud of the Not So Japanese section - it was quite a challenge to come up with a variety of bento box combinations that worked, that didn’t rely on the old standards! 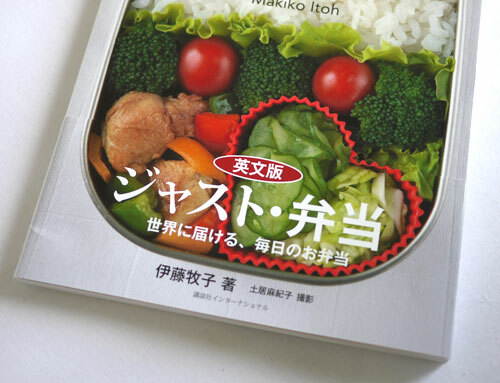 This is not a charaben/cute bento book; it’s a practical, “everyday lunch” bento book, just as the title says. There are many easy-to-do decoration ideas scattered throughout the book, and I guess at least one bento is decidedly cute, but it’s almost impossible to do highly decorative bentos in under 20 minutes, especially in the morning when you are rushed anyway. I did try to make the bentos attractive to the eye though, since the way our food looks is important! I’ve moved this section to the top of the cookbook info section . So…that’s it for the moment! I am both excited and very calm about the book - it was a lot of very hard work indeed, but I sure hope that it will be worth it in the end! I have already tweeted and er, Facebooked  (is that a word?) about this, but I got a nudge from a certain quarter to put it right here too. So here it is, tooting my own horn ^_^: The Just Bento Cookbook was selected by Amazon.com as one of the top 10 books in the Cooking, Food and Wine category in 2011  (so far)! I am in very good company there, with books with way bigger marketing budgets and stuff, so this is a really big honor. But even more than that, I’m really happy that the book has been granted space on the cookbook shelves of so many of you! Every email or message I get about it really thrills me. Thank you, Amazon.com editors, and thank you, everyone who’s bought the book! Arigatou! 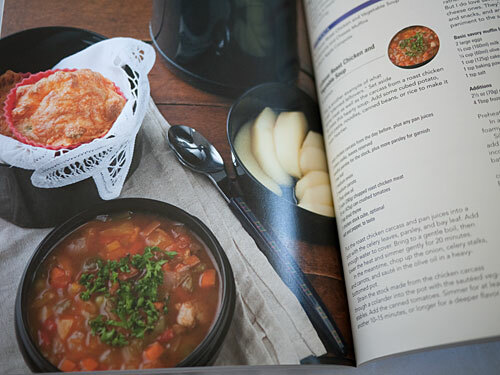 I was really excited to see my book so prominently mentioned on a national network of course, but it’s also an interesting look at how the Japanese media regards the increasing popularity of bentos internationally. Here’s an outline of what’s shown and said in the clip. (Note this is what they say - they may be a bit premature about some things, like how the book is selling so well in the U.S., since it won’t be available there for some time yet…but hey, maybe the reporter can see into the future! ^_^;) My comments are in square  brackets. After the opening shot, which shows a bento from my book (! ), the intro segment shows the opening of a branch of the largest takeout bento chain in Japan, Hotto Motto  (ほっともっと）, in Beijing, China. The store name in Chinese is “Hao Mai Dao (好麦道)”. It’s their first store overseas, let alone in China, and they plan to eventually open 200 stores thoughout the country within 5 years. The Beijing store sells typical Japanese style bentos like noriben  (which retails for around 210 yen) and karaage bento, using rice cooked Japanese-style. One thing that differs the Beijing store from the stores in Japan is that most customers eat their bentos in the store rather than taking it out, since there is no custom of taking packaged meals home to eat in China. 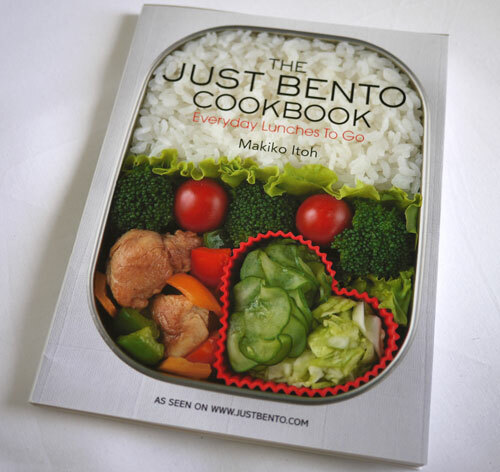 Then they switch over to America and Europe, where a book called The Just Bento Cookbook is tremendously popular! 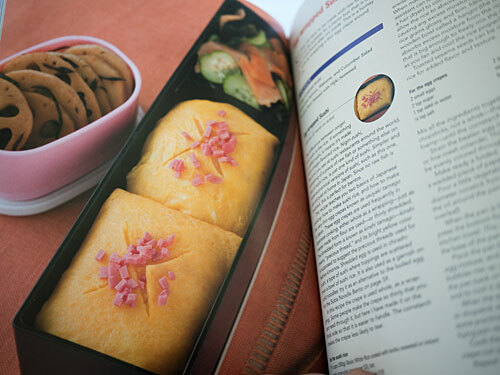 The book shows bentos like “Tamagoyaki Bento” and “Sushi Roll Bento”. Not only that, there’s even a French website (Bento&co ) that sells only bento boxes to customers overseas! It’s a worldwide Bento Tornado! The next segment talks about The Just Bento Cookbook. Written by a Japanese woman called Makiko Itoh [waves], it is entirely in English! The author has a tremendously popular website in English all about bentos, and the book was born from that site. Let’s take a look inside - it has bentos like the Mini Hamburger Bento, with flower cutouts of carrots and cheese, and gomashio on the rice - this book is being read by Americans! There’s also things like Ginger Pork Bento, and Sukiyaki Style Beef Bowl Bento. The fact that Americans are reading this is something to be very happy about. Here, the female personality/reporter sitting at the desk interjects that “Bentos are so healthy and taste so good” etc etc. The reporter turns to one of the male personality/reporters (Mr. Suga) and asks him, “What’s the no. 1 thing you want to eat in an obento?” The man says immediately, “tamagoyaki!” The other two nod in agreement, and the female reporter says “I love it!” The reporter says that the book not only shows how tamagoyaki is made, but has a sentence saying that many (Japanese) people really want there to be at least 1 or 2 pieces of tamagoyaki in their bentos every day. The people at the desk nod strongly in agreement, and the woman says, “Yes!”. The reporter goes on to say that the book not only teaches people how to make the food, but tells them a little about Japanese culture too (point emphasized by the on-screen text). The male commentator with the glasses (Mr. Suga) interjects that bentos are not only healthy, but are “eco” (good for the environment too) since the containers are reusable, and that’s part of the Japanese culture too. The woman nods in agreement. The reporter continues and says that the book also shows how to make onigiri, and tells the reader that beginners can use plastic wrap if they want, or their bare hands, and shows both methods. Picture on the screen: someone’s pudgy little hands making onigiri! The feature ends with the reporter suggesting to the commentator at the end of the desk about the possibility of using bentos as tools to better international relations. The man jokes back to him that perhaps he can put together a proposal for a Bento Summit. Here’s the Japanese page  about the feature. Here’s the link to the original video page . Many thanks to Thomas of Bento&co  for making the clip available - and congratulations to him for becoming a TV star ^_^! I don’t check the Amazon.com page for The Just Bento Cookbook  too often, but I was taking a look yesterday and saw that it has reached 150 reviews! Most are 5-star reviews, with a few 4 and 3 star reviews (hey, you can’t please everyone). I didn’t ask people to review the book at all, so seeing that so many people have taken the time to post one is very gratifying. If you posted one on Amazon.com, or any of the other Amazons - thank you! Also, with the exception of a few weeks here and there the book has been the no. 1 seller in the Japanese Cooking category on Amazon .com  for the last 2 years, and in the top 5 of the Asian category for a lot of that time too. I don’t know what to say about that really, except…I’m amazed and honored and very proud of my baby for being such an over achiever. The Just Bento Cookbook reached another milestone recently too: it is now in its 7th printing overall - quite an accomplishment I think a first time author’s cookbook. I am so grateful that the book has continued to sell so well, despite my extended absences from this site and Just Hungry  over the past couple of years as I dealt with some health issues and so on. The giveaway is now closed. The winners will be contacted and announced later this week. Thank you everyone for entering! 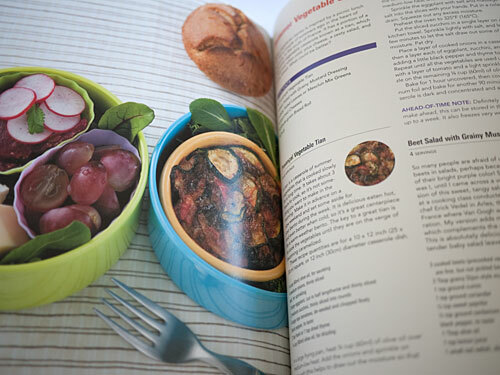 To commemorate the new edition of The Just Bento Cookbook , I’m going to give away 2 signed copies! The new edition has the exact same content as the previous edition, but just has a slightly different form factor (a wee bit smaller (but not much), and no dust jacket (but the cover is printed in full color)). I am very glad it has been reprinted again; as I mentioned before, the original publisher closed its doors in March, but the publishing rights were picked up by another division of the same parent company, Kodansha USA. So anyway, here’s your chance to get your hands on one! It’s too late to get the book to the winners before the holidays, but it should arrive in the New Year when you’re all ready to tackle those healthy/frugal eating resolutions. (optional) What you want to see on JustBento. A specific recipe? A how-to? I’m all ears! Only one entry/comment per person please! The deadline for posting your comment is 23:59:59 of Monday, December 19th CET (Central European Time). Two winners will be chosen at random, and I’ll contact them next week and announce them as soon as they’ve responded. So…I look forward to seeing your comments! Good luck! * Christoph originally from Germany, currently living in Osaka, Japan! Congratulations to Melissa and Christoph! Their signed copies are winging their way to them as we speak (at least I hope so, if The Guy made it to the post office in time...otherwise they'll go out tomorrow ^__^;). And thank you to everyone who entered! I loved reading a little bit about you all. I am constantly amazed at how widespread the Way of Bento has spread around the world - who knew that there are bento fans in Egypt, and Panama, and Turkey, and a lot, lot more! Anyway, Happy Holidays to everyone, wherever you may be! A couple of updates about the status of The Just Bento Cookbook. Secondly...it seems that the book has been selling so well just in preorder, that the publisher has already ordered a 2nd printing! This is pretty unusual I believe for any cookbook by essentially a first-time author (I'm not a first-time book author but it is my first cookbook) so I'm really happy about that. The book has already been available in Japan and some other countries in Asia since late September, and I've already gotten a lot of great feedback about it. Hopefully that will continue once it's let loose in the US ^_^;.